Marco Polo is known as a traveler and great discoverer; he is still a vivid figure in our imaginations and dreams about leaving the world as we know it. In Italo Calvino’s novel “Invisible Cities” Marco Polo appears as a messenger who creates a complete new language based on imagination, body based pictures and the use of objects to translate these stories in order to open a dialogue. Centuries later, the physical experience of weightlessness arrived in the human historiography with Yuri Gagarin, the first human who traveled into the outer space. For the first time, our narratives were amazingly shaken and connected with technical innovations and visions. Imagine if Marco Polo would have had Gagarin’s technical possibilities and utopistic understanding. How would have has it changed these tales speaking about magical discoveries? How would it influence his uses of objects or embodied images to create a unique language? What would remain after a long time? We are questioning the contemporary language of Performance Art, like Marco Polo and Yuri Gagarin questioned philosophical and physical principals in their times. Why nowadays Performance Art is using only techniques to extend the form instead of an honest search for an adequate language which points into the future? How can we create a dialogue which suits to the human relations even in the next century? From where comes our blind trust in Performance Art history and why don’t we start to be radical in questioning the profound elements of time, space and body? Similar like the gravity used to hold the human kind back for thousands of years before Yuri Gagarin appeared, Performance Art history has created a strong power. And we state, what makes the apple fall down to the ground: let us similar hold back in progressing with a future language. 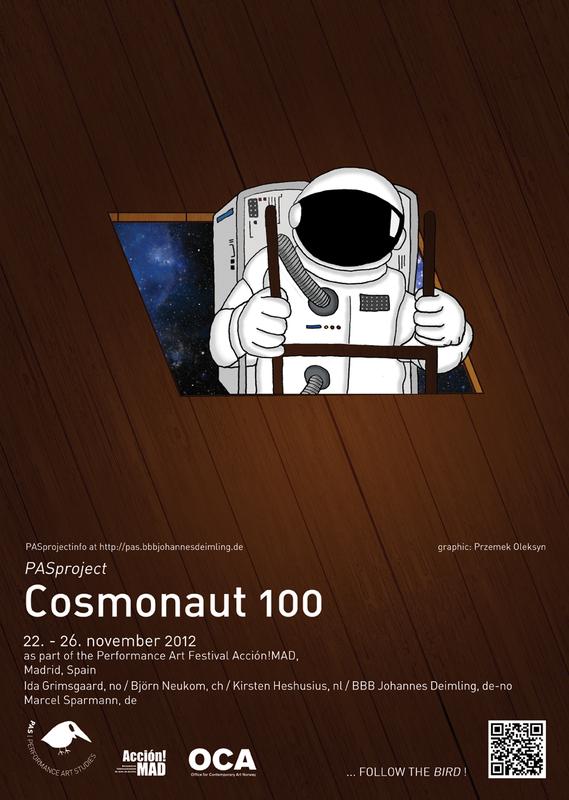 Cosmonaut is an attempt to connect an experimental and intuitive approach in articulation with the international Performance Art scene. Therefore Cosmonaut is a search for a shared thinking what is not immediately visible, but navigates in the space of possibilities. Based on contemporary approaches situated in stage design, referring to cinematic elements, based on light and sound or researching in alternative narratives, this project series aims to progressively and holistically shape the complex object of nowadays Performance Art. 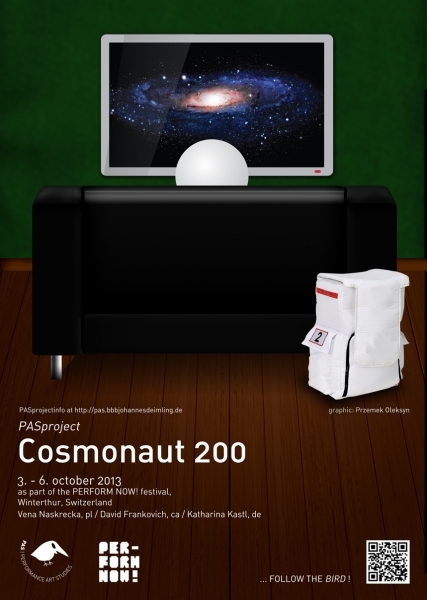 Cosmonaut is an aesthetic and cultural exploratory direction. It should be open to every form of creative articulation connected to the idea that Performance Art is the most relevant and innovative form of the arts to transmit life in an artistic process.